Are you thinking of starting a mobile food business? I’ve read that a successful food truck can bring in close to $500,000 per year in annual revenues. Startup costs can range from $40,000 to a couple hundred thousand dollars. However, concession trailers have a much lower start-up cost than a food truck. Does that spark your interest? Want to know more about concession trailers? Then you’ve come to the right place. Concession trailers are what you need to consider if you want to start up a mobile food business. Concession trailers come in various sizes and shapes, and can be outfitted with many options. You need to know some important factors to consider when searching for the right type for your needs. In this blog post we will discuss the key factors to use when you are looking to purchase a single or multiple concession trailers for your mobile food business. When thinking of starting a mobile food business, remember that there are so many different types of food trailers available on the market today. I suggest that you take the time to research different options and styles that you feel would best suit your needs. Finding the right one can be difficult, but don’t give up! In fact, you can build your concession trailer from the ground up, taking care to place exactly what you want inside. There are so many options, and it is important to plan ahead, same as you would if you were building a home. One of the first things you will need to do is to consider the types of foods you will be selling. The type food is important because this will help you eliminate all the concession trailers that are not good for that type of food. For example, you might need a place to hold a grill on the back deck of your trailer. That would require you to purchase or build a BBQ trailer. Some foods take more prep work than others. Therefore, you might need more counter space and room inside of your concession trailer. Some may use their concession trailer as a serving trailer only, which would not take as much equipment or room than other trailers on the market. In other words, knowing what type of food you will be selling will make your decision much easier when deciding on the right trailer for your mobile food business. You have to take into consideration the amount of storage for the foods you will have. Cabinets range from various sizes and designs. Storage is imperative when choosing any type of enclosed trailer and concession trailers. One very important thing to consider is whether you will get a new cooking trailer or a used one. The newer ones will have all the warranties, so definitely take this into consideration. The price difference between new and used trailers is very little. So, why not go new and have the warranty? Always consider how much your budget is for getting your trailer. This will help eliminate a lot of the trailers immediately. However, don’t just settle for just any trailer. Be sure it is exactly what you need and want before making a final decision. These are the most important things to consider before deciding to purchaseany concession trailers. Always be smart and do your research first so you can be sure you are getting the right trailer for the concession foods you want to sell. This will help you be more successful with your new business for sure.Remember, with the right upfront plan, you can successfully join the fast-growing billion-dollar mobile food market. What other tips do you have those looking to purchase concession or food trailers? We’d love to hear your thoughts and ideas. For questions regarding mobile food trailers, concession trailers, or advice, call Shore2Shore Trailers at 1-844-732-2746. Or, Contact Us here. 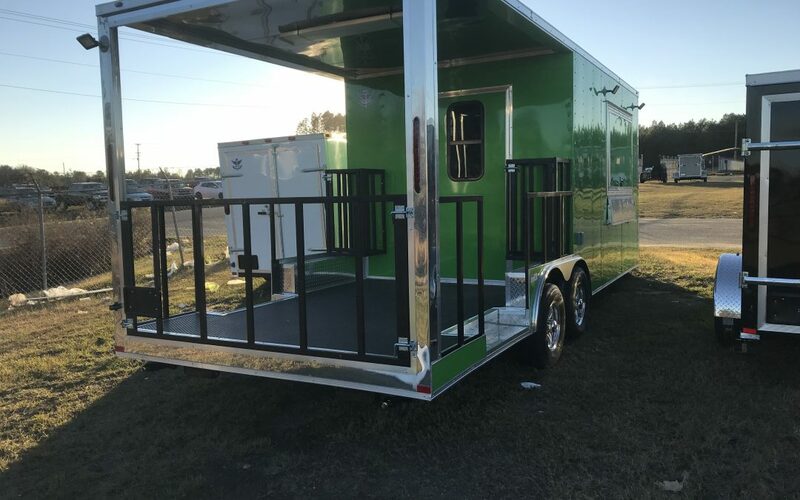 One of our sales staff will gladly answer any questions you have about concession trailers, and if you’re interested, can take your order today! For other articles on trailer buying, please visit our blog. Also, check out our ads for enclosed cargo trailers on Craigslist.